We must take action now, not only to regain our lost chocolate from the oppression of corporate cocoa policy, but to fight for all the future confectionery that will be lost in a bitter tyrade of cost cutting and damning of the traditional values we hold so dear. This page is here to inspire you all to fight for your chocolate and make your voice heard! The bi-monthly Bridlington A.C.A.C.C.A.C. demonstration march is always a big success. Arthur leads the parade down Bridlington high street where the angry mob, bitter that they can no longer enjoy a chewy Texan bar, smash up the local branch of Poundland. The police are powerless to stop such raw anger and emotion. At the very climax of the event, an effigy of a popular chocolate manufacturer, constructed entirely out of Snickers bars, is doused in lighter fluid, burnt and paraded to the door of Bridlington's local MP, where Arthur's mum hands in a petition, usually containing over 17 signatures. 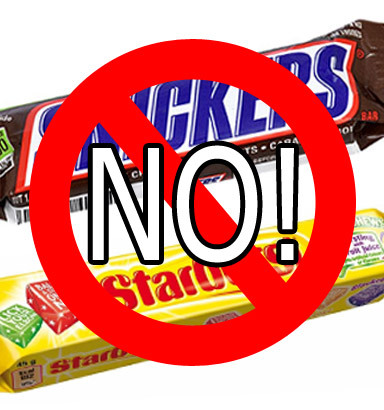 Why do you need to eat Snickers and Starburst? Do you have another favourite chocolate bar you buy, when all you really long for is a Texan? And do you really need another Easter egg with a chocolate bar next to it? Well don't settle for anything less than the genuine article! Arthur says boycott Snickers and Starburst and let's get these corporate scum where it hurts them most: in their big fat wallets! When the profits start falling, they'll soon come back to you begging for your custom.